Our side rakes adapt perfectly to the various field conditions. 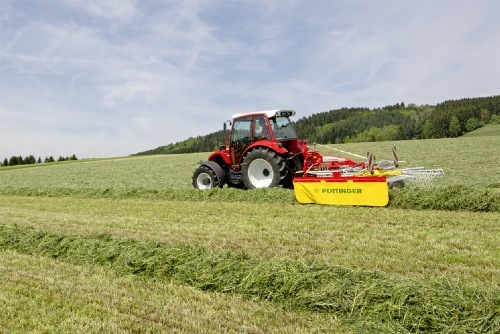 The perfect ground tracking delivered by PÖTTINGER rakes is achieved with the optimum basic setting and independent movement of the rotors. Tine arms per rotor - 12 pcs. 13 pcs. 13 pcs. Tine arms per rotor 12 pcs. 12 pcs. Tines per tine arm 4 pcs. 4 pcs. 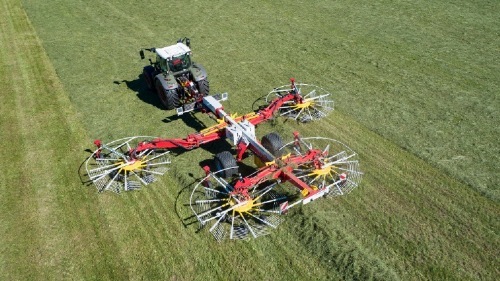 These twin rotor rakes are highly popular due to their economic price and excellent manoeuvrability. 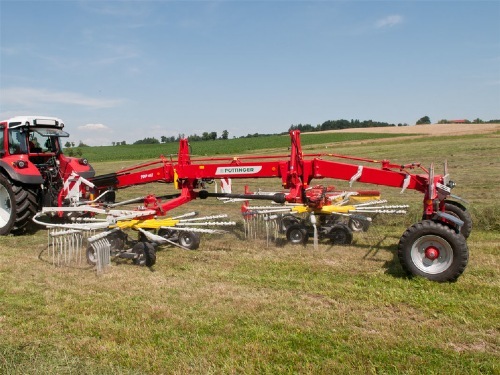 These side rakes can be flexibly configured to rake a large single swath or two narrow swaths. 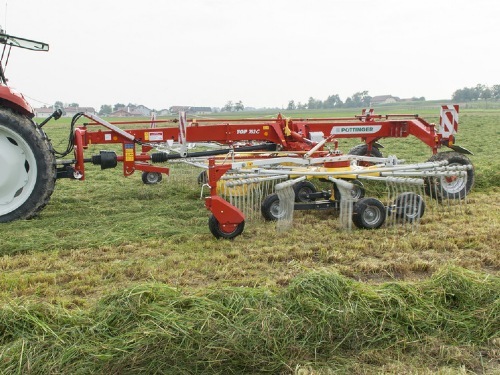 The hydraulic working width adjustment system enables the formation of a single swath or two double swaths. 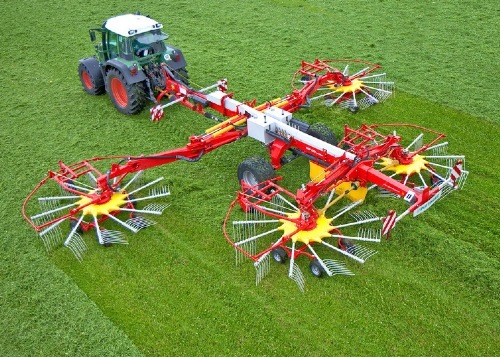 The machine is offset so that the rear rotor accepts the forage from the front rotor. The optional front swath curtain is raised. This setup places a double swath. The rear rotor is pivoted to the right. The front swath curtain is lowered so that each rotor forms its own swath. 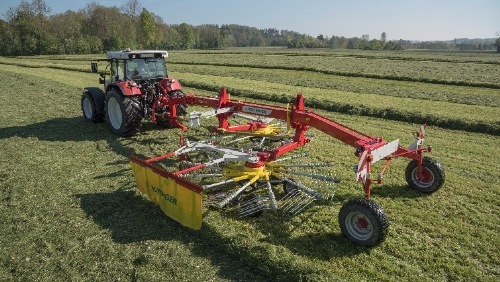 This makes it possible to form two small night swaths, or two normal-sized swaths in the case of very high forage volumes. The drawbar is equipped with a large support plate to provide extra stability on slopes and while cornering. 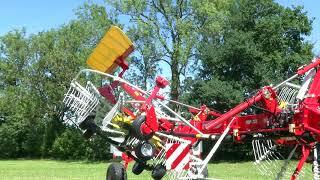 The frame is designed so that the two rotor units can ride over uneven ground completely independently of each other. Vertical freedom of movement is provided by a joint directly behind the angular gear unit. Transverse movement of the rear rotor unit is enabled by a pivot bearing mounted within the frame itself, and by a universal joint between the rear frame beam and the rotor unit. The tandem axles are also used as the transport chassis. 18 x 8.5-8 flotation tyres enable high travelling speeds. The rotors are lifted hydraulically to drive over swaths and at headland turns. 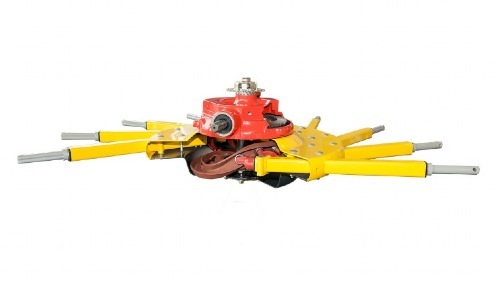 One single-acting connection to the tractor hydraulics is all that is needed for lifting. Hydraulic working width adjustment for a single swath or double swaths is possible with one double-acting connection. Stepping valves provide more convenient operation for raising and lowering the rotors. 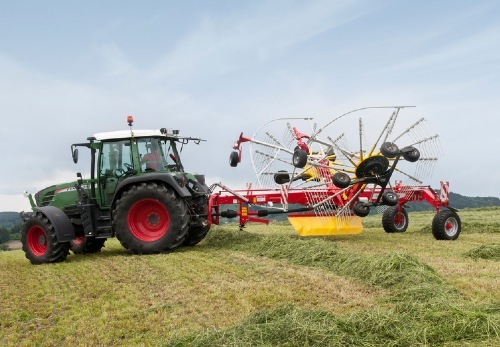 The hydraulic working width adjustment system can also be used to steer at the headland and enables perfect manoeuvrability. Hydraulic lifting in transport position. Hydraulic cylinders on the chassis and drawbar provide 50 cm of ground clearance. 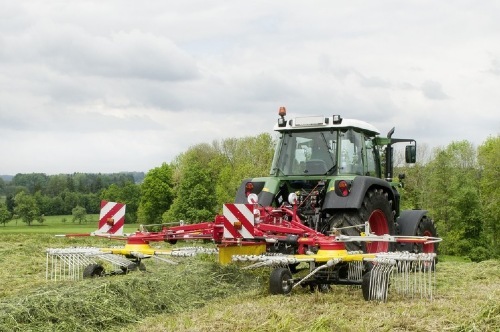 With optional hydraulic swath curtain lifting, the TOP 611 A TOPTECH PLUS has a transport width of less than 3.0 m without having to leave the cab to remove the tine arms.